The fire personnel rushed to the mishap site immediately and doused it off. 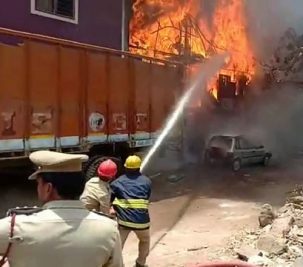 Hyderabad: A major fire broke out in a furniture warehouse beside a fuel filling station at Hindi Nagar near Moazzam Jahi Market here on Wednesday. No casualties were reported in the incident, which took place at around 1.30 pm and triggered panic among nearby residents and shopkeepers. 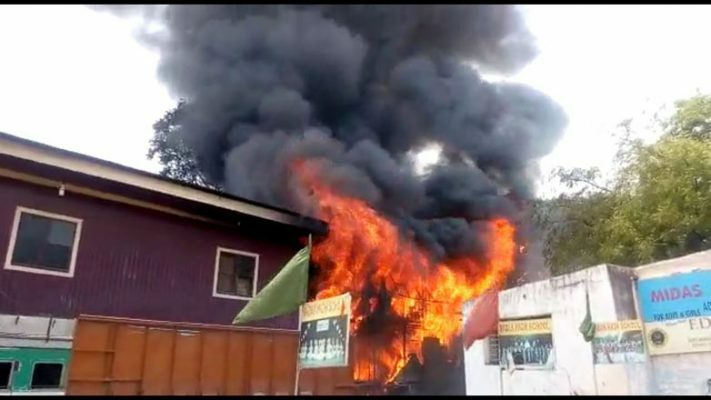 On noticing fire, shopkeepers alerted the Fire Services Department and fire tenders from Gowliguda were rushed to the spot to carry out fire-fighting operation. According to Begum Bazaar police, a short circuit was suspected to be the reason for the fire in the warehouse. There was no loss of life. As one fire engine was not sufficient to douse the fire, two more were called in to fight the fire and prevent it from spreading to others parts of the building. Two cars were gutted in the fire and the exact loss of property was yet to be ascertained, officials added.